1. 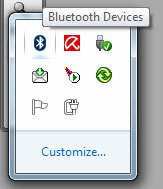 Click on bluetooth icon on taskbar. 2. Once the bluetooth manager window is open click on add a device. 3. When the bluetooth manager (on Windows 7) searches for a device, press the button beneath MSI BM500 mouse, you’ll need a pen to press the button. 4. After pressing the button underneath the mouse, your system should be able to “see” the mouse. 5. The operating system will then search a suitable driver and install it automatically. Once you see the following dialogue window, your mouse should be ready to use.